Can Albany and the City Council Save NYC From de Blasio’s Backward E-Bike Policy? State lawmakers have again introduced legislation to classify e-bikes as bicycles, rather than motor vehicles. Council Member Rafael Espinal has authored a resolution in support of the Albany bill, and is calling on the mayor to stop targeting commercial cyclists. Mayor de Blasio’s assault on delivery workers who rely on electric bikes is a national spectacle. As other cities welcome e-bikes as a spatially efficient and clean alternative to gasoline-powered vehicles, de Blasio’s NYPD is confiscating bikes and punishing working cyclists with hefty fines. Lawmakers in Albany have again introduced legislation to fix a quirk in state code that makes e-bikes legal to own, but illegal to ride. Responding to de Blasio’s crackdown, Brooklyn City Council rep Rafael Espinal has crafted a resolution in support of the Albany bill, and is calling on the mayor to stop targeting commercial cyclists. As in previous years, the state bill is sponsored by Sen. Martin Dilan of Brooklyn and Rochester’s David Gantt, who chairs the Assembly transportation committee. The bill would classify e-bikes as bicycles, rather than motor vehicles, and limit the electric motors to 750 watts. To be street legal, the bicycles would not be able to exceed 20 mph on level ground while the motor is engaged. Though he tries to sell it as a traffic safety initiative, de Blasio’s campaign to harass delivery workers was prompted by a complaint he fielded on the radio, and has no empirical basis. In a Daily News op-ed, Espinal notes how New York’s e-bike ban is out of step with other cities and states. Other cities have fully embraced e-bikes and are making them more accessible to commuters. San Francisco recently announced a 250 e-bike pilot program, while Baltimore and Birmingham, Ala., have integrated e-bikes into their bike-sharing schemes. Even Texas and Florida have more progressive e-bike laws than New York does. A facet of the Dilan/Gantt bill that sponsors should rethink is the helmet requirement. For one thing, NYC already has a helmet law for delivery workers. Espinal sees e-bikes as one answer to the city’s “transit crisis,” but since helmet mandates mostly serve to keep people from biking, requiring them for all riders would be a deterrent. The Dilan/Gantt bill has a handful of sponsors in each chamber. The bill’s chances this session are anyone’s guess. In the meantime, Espinal says de Blasio should “implement a moratorium” on e-bike enforcement. This is the same bill as last year, and this is almost certainly not its final form. Any bill likely to pass will probably only legalize statewide what is ALREADY LEGAL in NYC — that is, pedal-assist (class 1) e-bikes. Sorry… if delivery workers want to stop getting harassed, they need to disable their throttles. > A facet of the Dilan/Gantt bill that sponsors should rethink is the helmet requirement. A BIGGER facet they should reconsider is the prohibition of carrying children under the age of 16 as passengers, which would significantly crimp the usefulness of e-bikes for families wanting to do without a car. NOTE: there is NO age limit for child passengers on motorcycles in New York State. That’s right… you can take your 6-year-old on your Harley on the Cross Bronx Expressway or New York Thruway if you like. So why should that be banned on an e-bike??????? > In the meantime, Espinal says de Blasio should “implement a moratorium” on e-bike enforcement. DeBlasio should go after the e-bike shops that persist in selling illegal e-bikes. Get them to sell legal pedal-assist e-bikes instead. If they didn’t sell them, delivery workers wouldn’t ride them. A 750 watt limit is unnecessary. How about if you need more power to haul heavier weight? Unenforceable anyway. A typical single-rider e-bike does just fine with a 250W mid-drive motor (more efficient), or 350W hub motor (less efficient). Plenty of cargo bikes come with a 250W mid-drive motor as well. 750W is more than plenty. E-bike motors are rated based on CONTINUES output, i.e. how much power the motor can sustain without overheating. In actual use, transient power output frequently goes a lot higher than the nominal rating; while accelerating or hill climbing, for example. See here for how much (sustained) power you actually need for a bike. Going 20mph into a 15mph headwind on the flat, it tells me you need 290W total. 386W is enough to get you up a 3% grade with 15mph headwind at 10mph, carrying 150lb of payload. It’s no more or less enforceable than emission control on cars. As long as the stuff being sold conforms to the standards, then nobody is too worried if a few hobbyists “mod” their bikes otherwise. Personally, I’d rather have the allowed speed increased from 20 to 25 or 30 mph. In the outer boroughs especially 30 mph would be very useful. It would also let you keep up with motor traffic in a lot of places. As for power, more is always better but 750 watts is sufficient to go 30 mph either into a 15 mph headwind or up a 2% grade. It’s sufficient to go about 35 to 40 mph on a level road with no wind. That actually meshes with my experience on a pedal bike. My peak output now is about 750 watts, but only for the 5 or so seconds it takes me to accelerate to 20 mph. In my prime I could hold this output for a few blocks. I usually hit about 35 mph on level roads with no wind before pooping out. As Elizabeth F mentioned, the 750 watt rating is continuous, not momentary. Assuming the battery can put out the power, electric motors can run at 50% to more than 100% above their rated output for short intervals. I see your point if you’re talking vehicles like that. 750 watts would probably limit something like that to maybe 15 mph. And much less on any kind of grade. I think as those get more popular the regulations will probably evolve to account for them. Maybe allow 2 or 3 kW for a vehicle like that. That would be sufficient to go 20 mph under most common circumstances. UPS is already experimenting with these vehicles in Pittsburgh. DHL in Europe. NYC would be a natural place to try it out but our law restricts them. The vehicle shown fits the definition of “bicycle” in NYC, it fits the federal definition of “e-bike” and it does not fit the NYC definition of “motorized scooter.” Therefore, it is legal TODAY in NYC. There are companies already in NYC building and testing similar vehicles. Also of note… the vehicle shown above is almost certainly in Europe, where e-bike regulations are more stringent than those in NYC: 250W and 25 km/h max. This vehicle has four wheels (not 3), and therefore does not fit the definition of “bicycle” in NYC. It is not legal on the roads today. DHL is a big company. If they want to use these in NYC, they have plenty of resources to lobby for it. Please be clear how our law restricts them. Not because they are pedal assist (that is legal TODAY in NYC) or because they need >750W (they don’t). But because they have four wheels, not 3. 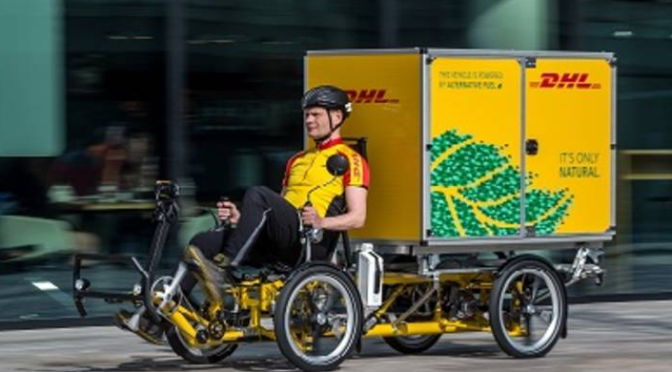 Three-wheel delivery vehicles are legal in NYC, and they exist. 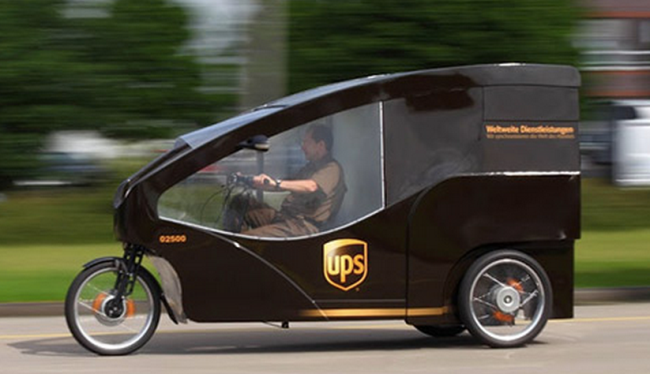 Also of note… delivery vehicles like the one shown should NOT be going 20mph, especially not in the bike lane!!! I accompanied a prototype delivery vehicle in NYC, and it worked; but everyone agreed that 10mph seemed like an appropriate and safe speed for it. The lower speed (compared to a regular e-bike) means less power needed, given the mass. The bill, sponsored by Sen. Thomas O'Mara of Elmira and Brooklyn Assembly rep Nick Perry, would enable adults to carry children on e-bikes. When Will Albany Finally Legalize Electric-Assist Bicycles? E-bikes are everywhere on NYC streets, and delivery workers, especially, rely on them. But they have never been legal in New York despite 2002 federal legislation classifying electric bikes of certain speeds as regular bicycles. Why Are Electric Bikes Illegal, Anyway? UPDATED: A cyclist became the first victim of road violence in 2019 when he was doored into traffic on busy Third Avenue in Brooklyn and then run over by another driver just hours after the ball dropped in Times Square. Oops — suddenly New York City's big dreams of an e-scooter revolution may need Albany's OK.